You will love how simple this grilled shrimp recipe is to prepare. 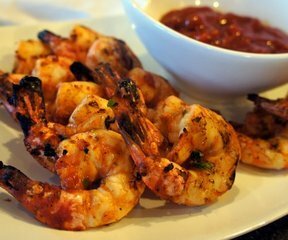 You just prepare a quick throw-together marinade, add the shrimp and let it marinate for a couple of hours in the refrigerator. Take it out and place it on a preheated grill. 10 minutes later it is ready and waiting to be enjoyed with family and friends. See how to prepare and care for your blueberries so they stay fresh and delicious for all those great summer blueberry recipes. Learn the best way to clean raspberries, plus step-by-step instructions on making raspberry coulis for some of your raspberry recipes.